6/12 Months - $33.99 12/24 Months - $33.99 Only 1 left! Is your tiny tot ready to howl at the moon? Awwwwww, did the li'l pup lose his pack? We better find him a new family! This Li'l Wolf Cub Costume for infants and toddlers will transform any little one into a wild canine who's ready to join mom and pops out on the hunt. Except instead of claws and fangs, it's going to be your little one decked out in this delightful romper costume! With luxe faux fur and soft plush velour, we think this is one pup that you're going to be glad to have in your pack! 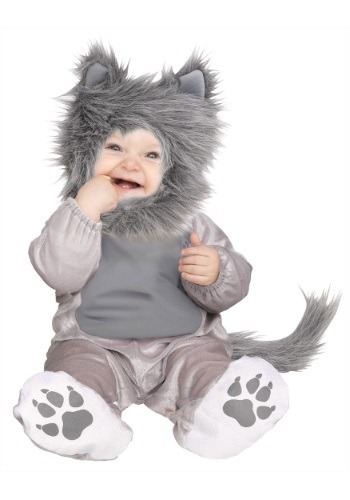 Outfit your child with this adorable look, and the only thing you'll have to do is teach them how to howl! Super cozy, and super comfortable, this jumpsuit features 100% polyester velour with polyester faux fur accents. (Phew! That's quite the wild mane there little guy!) Fit is an ease and a breeze, with snap up back and elastic cuffs, you won't have to endure any muss or fuss getting your little wolf in and out of this look. With removable Velcro tail and tie-on fur hoodie, you'll be able to turn your toddler from the wild side and get them ready for nap time with ease. When you use this delightful costume to turn your toddler or infant into a wolf cub, the only question we have is just what oh what is going to be on the menu? We think baby food is going to be out, and wild caught prey is going to be in!